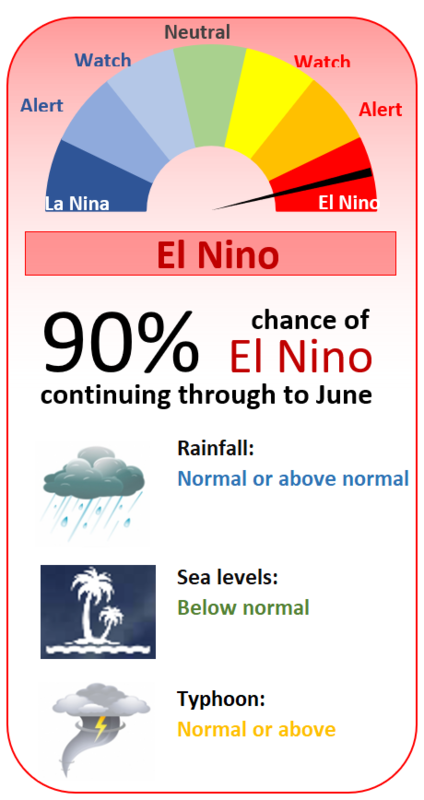 Sea levels are likely to be normal or below normal as weak El Nino conditions continue for the next few months. Whilst there are no King Tide warnings over the next couple of months, any larger wave conditions occurring at high tide will still have the potential to cause wave overwash and flooding. Neutral ENSO are likely to remain over the next few months with an increasing likelihood of transitioning in to El Nino conditions between August and October. Sea-levels around Kosrae are likely to remain between 2-4 inches higher than normal over the next few months. Sea-levels around Kosrae are likely to be between 3-5 inches higher than normal over the next few months. Some of the highest tides of the year also tend to occur during the December to February period. With higher than normal sea-levels, high tides will be pushed even higher than they normally are, resulting in very high water levels at high tide around every Spring tide over the next 3 months. Sea-levels around Kosrae are likely to be around 4 inches higher than normal over the next few months. Rainfall: Over the last 3 months (June, July and August), Kosrae has experienced drier than normal conditions. Slightly drier conditions are expected to continue through September with near normal rainfall expected for the remainder of the year. Typhoons: There is only a low likelihood of typhoons impacting or passing close to Kosrae over the remainder of this year. Sea-levels around Kosrae are likely to be 2 – 3 inches higher than normal over the next few months. Sea-levels around Kosrae are still higher than normal and are likely to continue to be about 4 inches higher than normal over the next few months. Some of the highest tides of the year also tend to occur during the December to February period. This is because the diurnal (once daily) tide component has its largest influence around the summer solstice (in December).